Bask in romance at Bostonian Seafood & Grill this year with a St. Valentine three-course dinner menu for an ultimate romantic date night. The menu begins with a glass of sparkling rosé as a welcome drink, followed by an oyster platter featuring seasonal bivalves from Japan, France, and Australia served with gin and tonic granita and citrus caviar. Guests can indulge in main courses such as roasted black cod fillet and blue lobster tail with rocket and potato cream, dehydrated Taggiasca olives and capers, or Kagoshima A5 wagyu beef striploin grilled like a “tagliata”, truffle potato mousseline and beetroot. Complement your romantic night with a delicate dessert of Hidden Rose with raspberry and rose mousse, chocolate crème brûlée and pistachio. 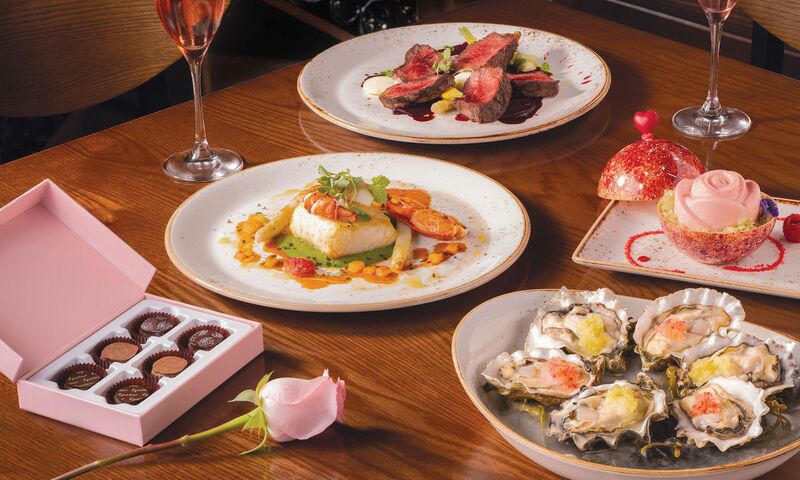 The Valentine’s Day romantic dinner menu includes two glasses of sparkling Rose, the signature Langham Pink chocolate gift box, a fresh pink rose and a complimentary Polaroid photo. The menu is available from February 13 to 16, with two seatings on February 14.